Just scored a pair of vintage playground rides — and brought them into the Fargo location of F.A.R.M.! Both are believed to be made of cast aluminum, with modest wear to what’s believed to be original paint. As always, contact us with your interest. We will ship — however, due to size and weight, we will need to calculate the exact cost based upon your specific location. Also, we would ship via UPS with their proper insurance and professional packaging service so as to ensure safe arrival. The super cool — and ultra coveted — Gametime rocket! Another great old Saddle Mate aluminum playground ride designed by Robert S. Wormser. Complete with USAF on the tail. Marked patent pending, however also lists a patent number 210393. Circa late 1960s, early 1970s. 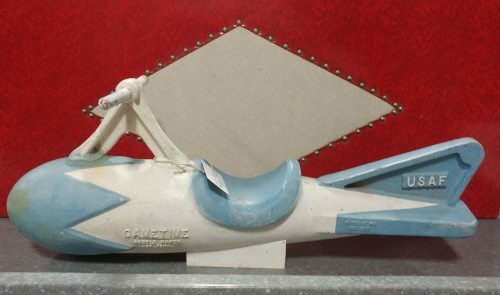 Sadly, this classic, mid-century, space-age playground rocket ship design is no longer in production. What a thrill it must have been to ride! And what a thrill to own one! 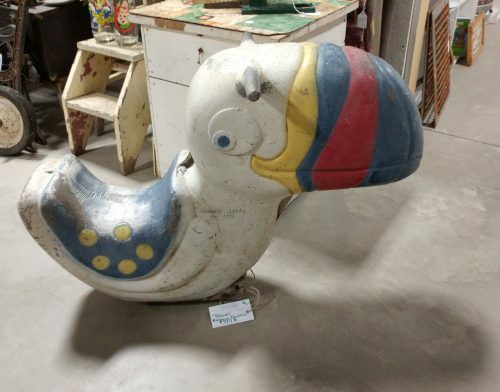 Last, but not least, this vintage Saddle Mates Toucan! Also known as the Saddle Mate Bird or Swampy, designed by Robert S. Wormser. Circa late 1970s. Also marked “Pat Pend”, so an early production. Super cute & quite charming as is, but these vintage playground pieces can be repainted to suit your decor and whimsical desires too. Both pieces were each once on large springs. Those had removed before we found them; however, each vintage playground ride is in good enough condition to once again be attached to a new spring or “ride” mechanism, should the collector wish it. Very cool mid-century pieces of childhood nostalgia. If these old aluminum playground rides bring back great memories, you may wish to check out Once Upon a Playground: A Celebration of Classic American Playgrounds, 1920–1975!